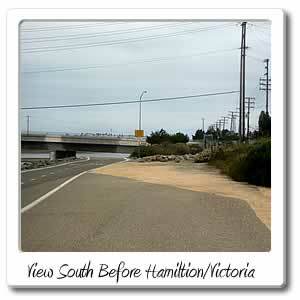 Welcome to Victoria Street/ Hamilton Avenue on the Santa Ana River bicycle trail. Not too far from mile marker 1 on the Santa Ana River Trail, at 1.3 miles and about 12 minutes, from the beach is the Victoria Street/ Hamilton Avenue entry point for the Santa Ana River Trail. 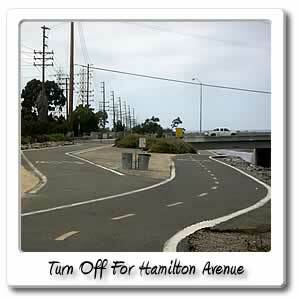 If you go left or West on the bridge, will be Hamilton Avenue and 100 feet away is Brookhurst Street running North and South. At that intersection, one of the corners has a Carl's Jr. and a gas station. On the other corner, you'll find a shopping center, with a couple places to eat and drink. 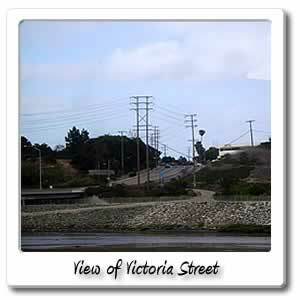 On your right or looking to the East is a very steep hill that goes into the City of Costa Mesa and the street name is Victoria Street. Also on that same side of the Santa Ana River, there's another paved bike trail that merges into the Santa Ana River Trail, to the North, right after you cross over the river on the bridge. 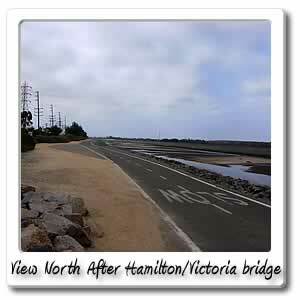 The other paved trail is called Banning Channel Bikeway and starts South just before the Pacific Coast Highway bridge. It doesn't go under the Pacific Coast Highway bridge though, you'll end up turning, and going out a gate that takes you to Westbound Pacific Coast Highway, that will take you back by the entrance to the Santa Ana River Trail. On the other side of Victoria Street is Vista Victoria Park. There are restrooms, picnic benches, concrete trails and a little parking lot. If you go west or toward the river trail, you can go onto the other side of the river trail, and you'll end up at the southern part of the Talbert Nature Preserve, and through there going east you'll end up at Fairview Park, which is an interesting place, not only because it's next to the Talbert Nature Preserve, but it has grassy area, where people fly kites, ride horses, hike and ride on free model trains on the third weekend of the month. There are also quiet picnic areas for small groups. Getting back to East on Victoria Street, through the City of Costa Mesa. If you pass the paved trail on the East bank of the Santa Ana River, and go about 40 feet past a locked gate, you will then see a small dirt path, next to a small brown sign, that takes you into South Talbert Nature Preserve Continueing East on Victoria Street, after .3 miles and about 3 minutes, you'll come up to a small shopping center that has a liquor store, a donut shop, and some other shops. 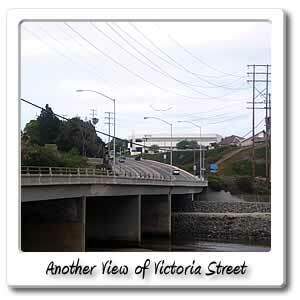 Right across the street from there is Vista Victoria Park, which offer great views of Victoria Street that turns into Hamilton Avenue right after the Santa Ana River. You can see people on bikes, running and walking on the Santa Ana River Trail. If you look a little bit North of the side of the hill, you'll see the beginning of the North Talbert Nature Preserve . You can get an even better view, if you enter Fairview Park from Pacific Avenue. As far as parking, you can park at Fairview Park in three different sections, two of which are very close to Victoria Street. The first is North up Victoria Place which is along the side and the entrance to Vista Victoria Park and across the street from the liquor store and donut shop. You continue North on Victoria Place until it turns into Pacific Avenue, then there will be the first parking lot with $%^$%^ regular parking spaces and $%^$%^ handicap ones. To get to there on bike it takes about .9 miles and 6 minutes to reach off of the Santa Ana River Trail. About half a mile off of Victoria heading East, or making a right off of the trail, you'll find office buildings, then a donut shop will pop up. From this point, you'll have to go another 3/4 miles, passing by homes, offices, and an elementary school before you get to a main intersection, which only has a 7-11. Nearby is 97 acre Talbert Regional Park, and is located at 1256 Victoria Street, in the City of Costa Mesa the park is mostly a network of dirt trails, and doesn't appear to have any restrooms or drinking fountains. At the northern park, it has a small pond. Off through the trails you will come to another part of to the east and this is 35 acre Canyon Community Park with trails in it too, and not only that it's dog friendly. The park is located at 970 Arbor Street in Costa Mesa, and also has 2 playgrounds and 12 picnic tables.